Let me run off topic for a minute before I get started. I’ve been getting a lot of questions about photography lately and I had an idea that might help. If you have questions would you post them in the comment box please? If there are enough questions I’ll devote a post to tackling as many issues as I can. I don’t promise to have all the answers, but I’ll give it my best. I’ve only been shooting food for two years and I’m still learning. Food is quite difficult compared to taking pictures of people, landscapes, or prop photography. It’s a huge learning curve for me, and probably the biggest challenge I’ve taken on with photography so far. But, I think that’s what draws me to food work; it makes me use my brain on a very regular basis. I need that! It would rot out of my head otherwise. Now I’m left guessing why they never taught us food photography in college. They just sort of let us pick our subjects. I wonder if any university helps their students focus on learning food photography? There must be one somewhere. I’ll stop rambling now and get to lunch. Clara only had three days of school due to service days, so the list is short this week. Also, Laptop Lunches has their monthly newsletter out. They’ve been such a great resource for information it’s worth a quick read. We made homemade crunchy granola bars for lunches this week. I can't believe how stinkin' easy they are! Five minute prep tops. It's no wonder these big companies put so much marketing into getting us to buy their stupid bars. They're terrified we'll figure out they're crazy easy to make at home and they'll go out of business! They freeze well too, and most of them are packed away in a bag in the freezer waiting to be used in future lunches. If you make the Playgroup Granola Bars watch them closely near the end. I think I pulled them out 5 minutes early, right before they started to burn. Once they burn you'll have to start over, there's no way to salvage them. Week of May 3rd-May 7th 2010. Large covered- Boiled hotdog wrapped in American cheese and a homemade tortilla (in foil), 1 cheese stick, freeze dried strawberries, 4 Hershey’s Kisses, 1 small covered container bleu cheese dressing (for carrots). Food thermos- Bison Potato Soup with Bacon & Veggies. Two small pieces cheese bread wrapped in foil. Large box uncovered- Bagel with cream cheese & ham, wrapped in foil. Two small homemade crunchy granola bars in a snack bag. Look at all that color - a feast for the eyes as well as the tummy! 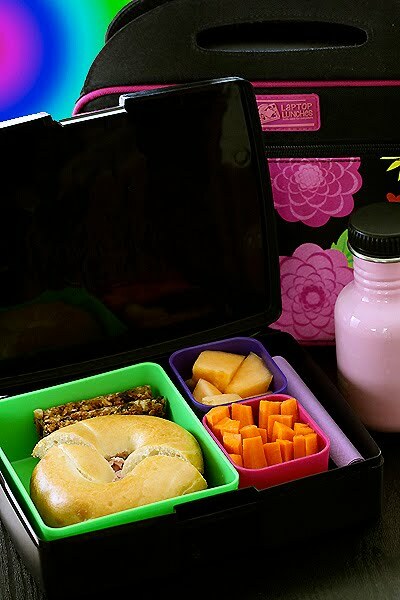 I would love to have great lunches like this. :o) Your Friday posts are so helpful to come up with different combinations for my boys lunches. Photography questions: You have already answered quite some and they were incredibly helpful but what are your tips on food styling? Also besides the website you sent me are there any other helpful photography websites for beginners? Anything in specific for food photography? Yummy and light lunch! Nice! My food photography question is....will you move in with me and work for free as my photographer? Thanks. I think that's my only hope until I get unlazy enough to take a class and get a decent camera. And as for homemade granola bars, I've yet to make a recipe I'm completely happy with. I want the soft chewy kind you can buy and it seems impossible to get it the right consistency. It seems they don't bake them at all but put some kind of sticky glaze in the mix before patting and cutting into bars but my own attempts at creating a glaze that would stick the mass of stuff together has not been that great. I'm so sick of trying granola bar recipes. Groan. Thanks Shar. You'd think I could at least spot that error lol! I'll have to fix it when I get home.